Round bead end caps, 9mm. 18k Gold Micro Diamond Pave Hoop Earrings, 1.5"
David Yurman cable cuff bracelet. Sculpted cable cuff in resin. 18-karat yellow gold interior plating. Approx. 1.6"W (40mm). Slip-on style. David Yurman cable cuff bracelet. Sculpted cable cuff in resin. 18-karat yellow gold interior plating. Approx. 1.6"W (40mm). Slip-on style. Imported. 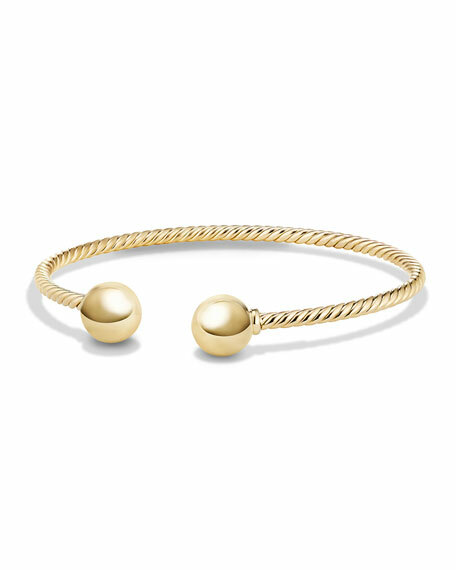 David Yurman bracelet from the Helena Collection. Twisted sterling silver cuff. 18-karat gold wrap with white diamonds. 0.47 total diamond carat weight. Approx. 4mm (0.2"). Slip-on style. David Yurman bracelet from the Solari Collection. 18-karat yellow gold cable cuff, 2.6mm. Pavé diamond bead caps, 6mm. 0.35 total diamond carat weight. Slip-on style. David Yurman bracelet from the Châtelaine Collection. Twisted sterling silver bypass cuff. Faceted 18-karat gold domes, 7 and 9mm. Diamond four-prong settings. 0.077 total diamond carat weight. Slip-on style.